I don't think I had ever been in Perkinsfield before. It is the small francophone village with the deceivingly English name located in Tiny Township. Even Tiny isn't actually tiny, but named after one of Elizabeth Gwillim Simcoe's small fluffy dogs! 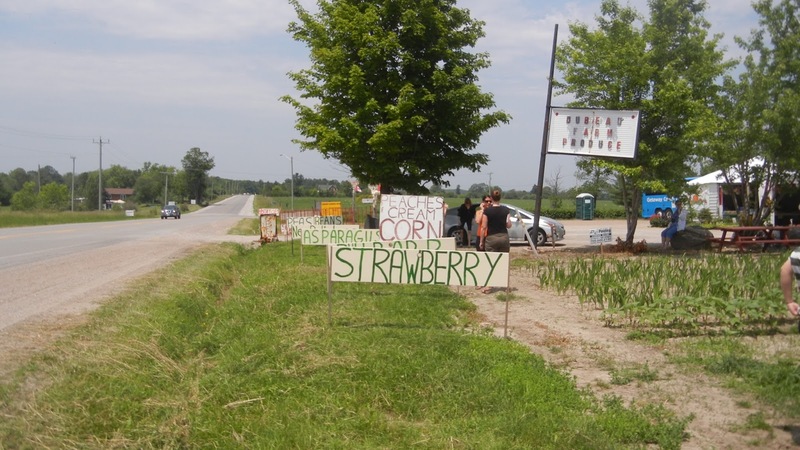 I visited Perkinsfield for the first time in June, when the Huronia Food Trail media tour bus stopped at Dubeau Family Farm at the corner of County Rd. 6 and Tiny Concession 11. 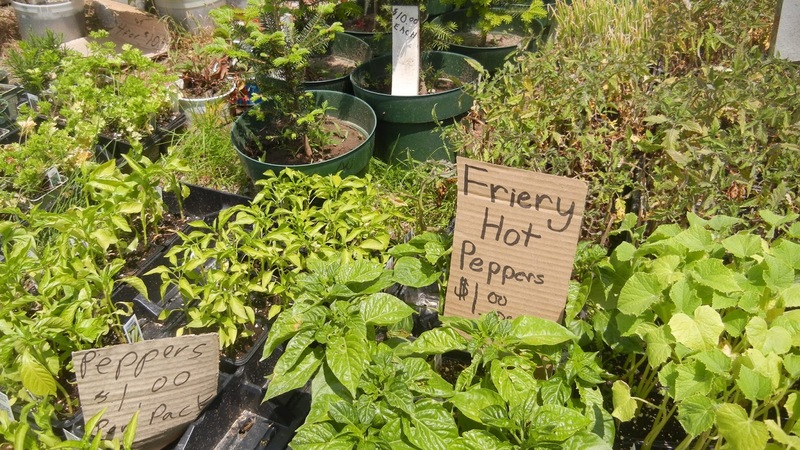 Stepping out and approaching the produce stand, I quickly saw some great deals on potted herbs and vegetables and started to figure out what cash I had brought with me, but just as quickly decided I better not try to juggle too many dirt filled pots on a coach bus. 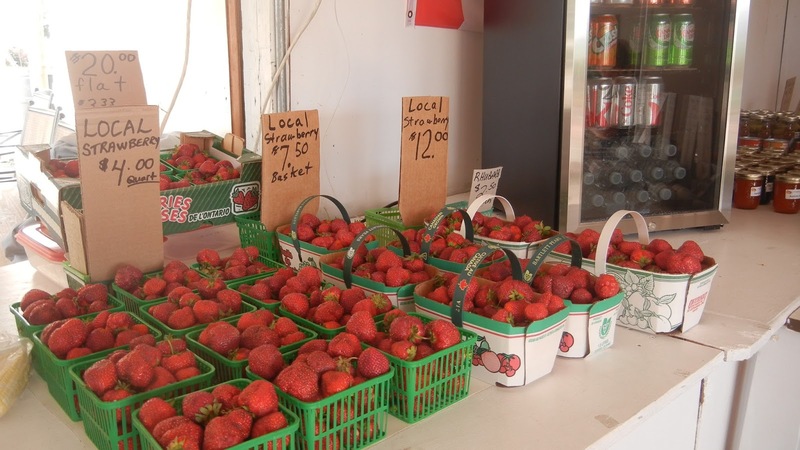 Dubeau Family Farm is so much more than a place you can grab a dozen corn on the way back home from the beach. I was expecting the fresh local produce, but I wasn't thinking about pies, jams and pickles all made by co-owner, Mrs. Kim Dubeau, the honey from Innisfil, local eggs or the home grown sunflowers and glads to complete your table. Later in the season, come back for a pumpkin or squash, or even a hay bale or corn stalk to decorate your front porch for fall. Kim's husband, Dennis Dubeau, the man behind the field work, invited us out onto his land for a mini tour and talk about his 50 acres and what he grows on it. The land stretched to a far off tree line and I was amazed that a couple and 2 teen sons, with only occasional help from extended family, could run such an operation. I have a hard time getting my kids to hang up their back packs! They work hard 7 days a week from 5:00 a.m. to 10:00 p.m., but I did hear that they all go away to Aruba in the winter. Maybe I would get more work out of my kids if I offered them a sunny vacation. At the time of our tour, the Dubeaus were looking forward to a new venture for this summer - a pick your own tomatoes deal. I wonder how that turned out? I know my own tomato plants went completely crazy during that extreme heat wave we had in July and grew to 5 feet in height. They are now producing lots of juicy red tomatoes. Considering my tomato plants were almost completely neglected, I can only guess that Dennis Dubeau's well tended plants were an overwhelming success. I hope so. This hard working family deserves to do well.